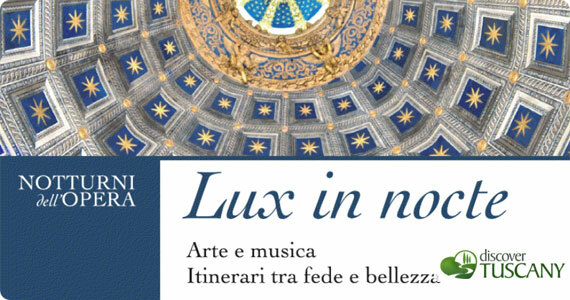 On Thursday June 21st, the Opera della Metropolitana and the Arcidiocesi of Siena presents the event Lux in Nocte, a special and unique occasion to enjoy the artistic heritage of the city through unusual itineraries. The Cathedral, the Crypt, the Opera Museum and The Baptistry in Siena, (from 9.00 pm to 12.00 pm) will open the doors to evening guided visits accompanied by music to underline the profound spiritual relationship between the artworks and its context . Several guides will illustrate an itinerary which starts from the Crypt exceptionally hosting “The Baptism of Christ” by Tiziano borrowed from the Musei Capitolini, then heads to the Opera Museum which presents the “Maestà” by Duccio Buoninsegna then to the Cathedral to view the Relics of St. John the Baptist and ends into a visit at the Piccolomini Library. At the same time, from the Crypt at 9.30 pm starts an itinerary dedicated to kids: exploring the fantastic as well as real animals present in the artworks inside the complexes. Hope you will enjoy this special night! To see Calcio Storico Fiorentino or not….